A study led in part by physicists at the Indiana University Center for the Exploration of Energy and Matter could provide new insight into the composition of the universe immediately after the Big Bang—as well as improve calculations used to predict the life span of stars and describe the rules that govern the subatomic world. "This is a significant improvement compared to previous experiments," said Liu, who is a leader on the UNCtau experiment, which uses neutrons from the Los Alamos Neutron Science Center Ultracold Neutron source at Los Alamos National Laboratory in New Mexico. "The data is far more accurate than what we've had before." The rate of the decay of neutrons—subatomic particles with no charge—is significant because it is used to predict the proportion of hydrogen and helium in the universe a few minutes after the Big Bang. The number also affects calculations used to determine how quickly hydrogen atoms burn up inside stars and the rules that control the elementary particles like quarks and gluons. This is because during neutron decay, one "up" quark transforms into a "down" quark, a process that physicists don't yet fully understand. The "bottle" method: Counting the number of neutrons that remain over time after being trapped inside a container. The "beam" method: Measuring the rate of protons that emerge from a neutron beam generated by a nuclear reactor. 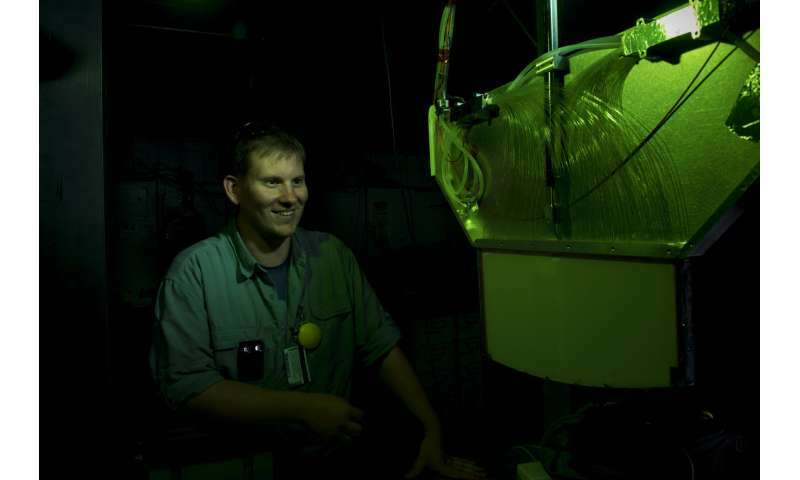 Some physicists regard the beam method as more accurate because the bottle method risks miscounting neutrons absorbed into the container as disappearing from decay. But the study from Liu and colleagues uses an invisible container made from magnetic fields and gravity to eliminate the risk of interference from physical material. As a result, the experiment can measure a neutron's lifetime with a high level of precision. 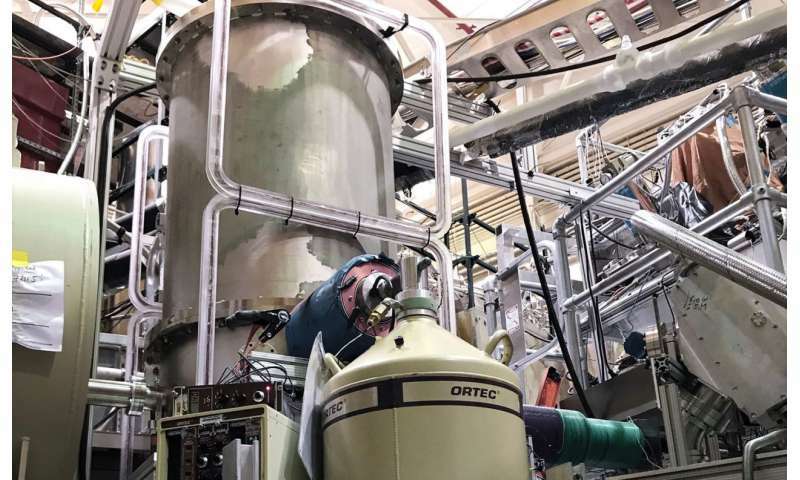 "A neutron could technically live inside our trap for three weeks, which is much longer than any other previously constructed 'bottle' traps," Liu said. "This long trap lifetime is what makes it possible to achieve a highly accurate measurement." The use of a "magneto-gravitational trap," in which the neutrons' magnetic charge and mass prevent them from escaping their container, also makes it easier to measure the neutrons because the bottle is "lidless," Liu said. Liu's lab joined the UNCtau experiment in 2011 to help re-invigorate the project. The work required five years to design, fabricate, test and install their equipment at the neutron source in Los Alamos, after which the team began to run experiments and collect data. Members of Liu's lab regularly travel to New Mexico to test equipment, run experiments and record the results. "Five years to get an experiment running and producing data is very fast in our field," Liu said. "We spent about six months on site and six months creating hardware each year. It was really a cycle of fast prototyping and improvement. We would never have been able to renovate the technology without the mechanical and technical support available at the IU Center for the Exploration of Energy and Matter." I can see where the accuracy of this method degrades with various factors including trap size, hold times, etc., but the resolution accuracy increases as the neutron population grows. For this reason I anticipate this method of measurement becoming much more accurate over time, as the number of neutrons held in the trap improves with new technology. Consider the growth in the number of atoms held in Bose-Einstein condensates as a historical parallel. Because unlike you they know what they are talking about. Ummm they are exactly collecting a positive charged particle ... the only way to detect neutron decay is to wait for it to decay into a proton and then be attracted to the collector. What you are implying is that is wasn't a tight vacuum to begin with and they don't account for noise, which i figure the smart people would do. I take it that you weren't educated in "elementary school Einstein"??? "...makes you think their not just collecting..." is wrong. "...makes you think they're not just collecting..." is right. I'm running away from these "primary schools of Einstein", and you have also completed "Einstein's faculty"